In the 15 years since Second Life hit the market, the online virtual world has given more than 15 million registered users the ability to transport and transform themselves in a space designed completely by the avatars who call it home. While receiving less publicity in recent years, roughly half a million users still log significant “inworld” hours – and an estimated 40-60 percent count themselves as disabled. This statistic shouldn’t be surprising, yet for many—including those tasked with creating the next new “thing” in the tech world—it is, says UCI anthropologist Tom Boellstorff. But technology isn’t often designed with these specialized needs in mind. And that’s something Boellstorff—through academic research in the virtual and physical worlds—is hoping to change. It’s a case he made this spring in Silicon Valley when he met with Second Life creator Philip Rosedale and his team at High Fidelity; with Ebbe Altberg, the head of Linden Lab which runs Second Life; and in D.C. before multiple members of Congress, several of whom determine levels of National Science Foundation funding which have supported Boellstorff’s work. It’s also the focus of a new documentary highlighting how online worlds facilitate deep connections for disability communities. And that’s where Tom Bukowski’s story picks up. When Boellstorff first entered Second Life in 2004, he did so as the avatar Tom Bukowski with a gamer’s background and an ethnographer’s intent. A member of the first generation in the U.S. for whom video games were a part of everyday life, it was a somewhat easy jump for the early adopter of technology and simulation games like Sim City. Boellstorff had paid close attention growing up to the first iterations of three-dimensional worlds that linked global players online through text and voice, but he hadn’t yet studied them formally as an academic. While pursuing his Ph.D., he completed an extensive ethnographic study of the lives of gay men in Indonesia which was the focus of two subsequent books. So when he was looking for his next big project, the Stanford-trained anthropologist set his sights on a new challenge: virtual worlds. He took all of his ethnographic experience to the new realm where he says many of the same participant observation study methods he’d previously employed applied. For Boellstorff, the goal was to blend in, observe and when appropriate, interview, so rather than appearing as a vampire or a cat or an inanimate object like a fridge, his default avatar looks similar to his physical-world self—a white male with brown hair and a goatee. But he has updated his avatar over the years and has been known to show up to Halloween parties in Second Life as a robotic cat or a jellyfish. But how other people choose to embody themselves is incredibly interesting, he says, and he spent quite a bit of time on the topic with those he encountered. The idea became even more intriguing as he began to interact with many people who identified as having disabilities. Like Fran, a 90+ year-old woman whose mobility is limited due to Parkinson’s disease in the physical world, but in Second Life, she’s a young, flawless looking blonde who glides with ease. And Shyla, a middle-aged woman with chronic pain so severe that she spends most of her day in a specially designed chair lying on her back. In Second Life, she’s a superhero gecko who can fly around and interact with anyone. Cody LaScala is another person Boellstorff has met through Second Life. LaScala is a 30-year-old who experienced a near-death drowning on his first birthday, and has been confined to a wheelchair with a round-the-clock caregiver ever since. 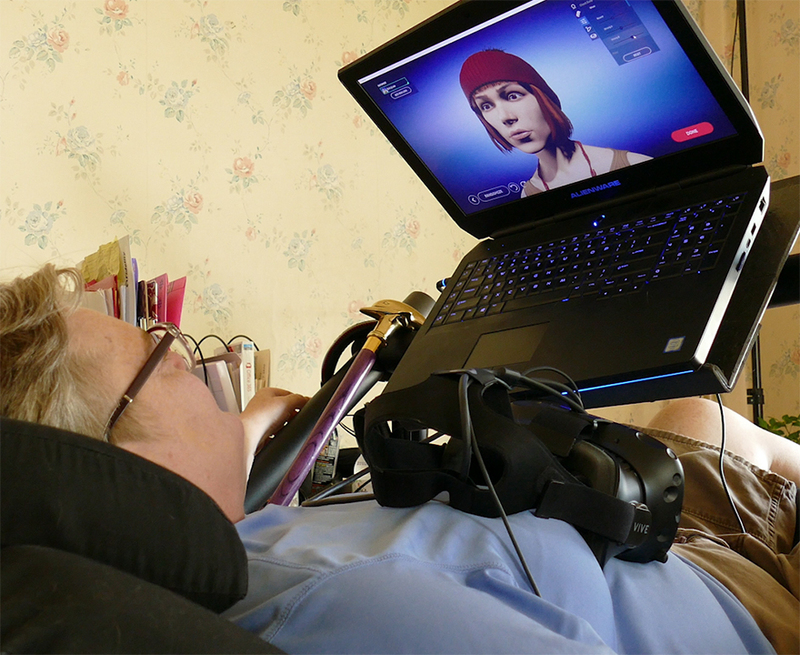 LaScala uses adaptive technology and the help of his caregiver, Cecii Zapien, to actively participate in Second Life. While some people use the nearly unlimited avatar options possible in Second Life to make themselves appear different from their physical-world selves, LaScala’s purposely mirrors his physical-world self. The notion is something Boellstorff explores deeply in his research. He’s received $277,000 in funding since 2015 from the National Science Foundation to better understand how online environments impact social interaction and self-understanding as well as physical world experiences of disability. He also studies which aspects of online social interaction are linked to specific disabilities and how differing platforms and devices are used. As part of his research, Boellstorff and Donna Z. Davis, his co-researcher from the University of Oregon, were able to create their own island in Second Life called “Ethnographia Island.” Some disabled participants were given plots of land for the duration of the research project (which ended in July 2018) so they could build anything they wished that expressed their experience of disability. They also ran focus group meetings on the island where Shyla, LaScala, and others shared their stories of living with a disability. Some of these stories ended up appearing in “Our Digital Selves,” a documentary produced by Bernhard Drax that chronicles this research project. 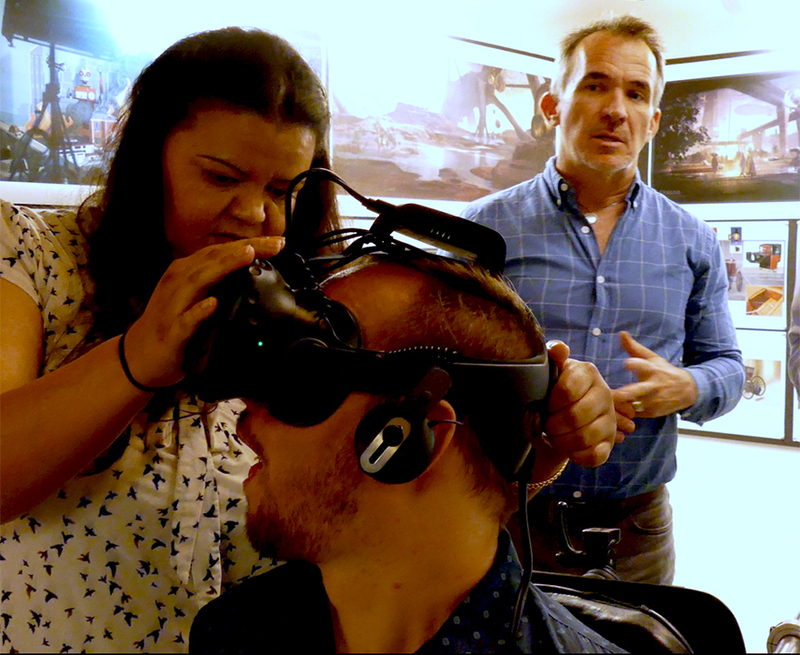 Through interviews in both the virtual and physical worlds, the film follows the work of Boellstorff and team from inside their Second Life activities to Silicon Valley where they meet with Second Life’s creators to talk about technology design for the disabled community. LaScala even recreated the scene of his accident in the film as a way to share his story. The documentary debuted at a Congressional meeting that was part of the 2018 Coalition on National Science Funding Exhibition and Hill Day. Boellstorff was one of several social scientists who got to showcase his work—considered as “blue sky” research for which the practical benefits may not be immediately apparent—and thank Congress for their support. “We know from experience that it is precisely basic research that often leads to innovations of lasting societal impact,” he says. LaScala also made the trek—with Zapien—and participated in a Q&A about his experiences using virtual worlds, discussing how they provide vital social connections and new personal and economic opportunities for disabled people. Boellstorff’s hope is that by sharing this research and the stories of those whose lives have been changed by the possibilities virtual worlds provide, the technologies of tomorrow will be designed with the disabled community in mind, and “blue sky” funding will continue to be available to pursue the unknown. -photos, courtesy of Bernhard Drax, from top down: Boellstorff in his office while conducting research in Second Life. Shyla spends time inworld with the help of her specially designed chair. Zapien helps LaScala with his VR glasses while Boellstorff and team are meeting with technology makers in Silicon Valley. 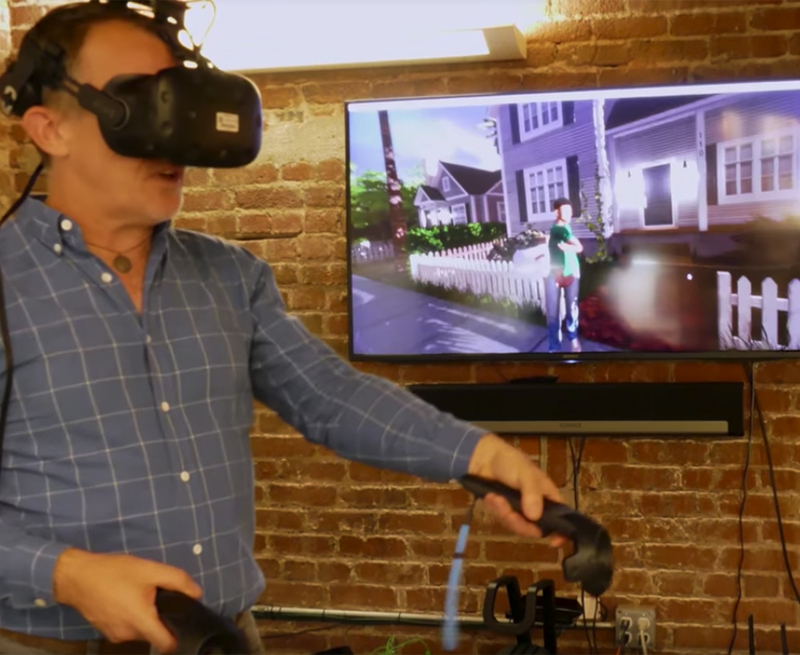 Boellstorff demos new VR technology.